The 1794 Starred Reverse Liberty Cap Large Cent: One of the rarest of all cents. This coin is noted for having 94 very tiny five-pointed stars located between the dentils (toothlike devices encircling the rim of some coins) on the reverse. The discovery of the stars is credited to Henry Chapman in 1877. Yes, it took 83 years before anyone noticed the stars! Despite extensive research, numismatists have never determined the purpose for their existence, nor exactly how the stars got there. Several theories have been proposed. One explanation put forth in 1880 is that the stars were placed on pattern coinage planchets from 1792 that never got used. These were pulled from storage and overstruck with the 1794 cent dies. Another plausible possibility is that the stars were put there as part of an anti-counterfeiting test that never amounted to much. One thing nearly everyone has agreed upon is the stars were not intended as an integral feature of the 1794 cent reverse design. There are 94 stars but only 83 dentils. To appear properly balanced, the number of stars and dentils should match. This has led researchers to conclude the stars were originally created for some other reason, yet ended up on a few 1794 cents. Perhaps someday we will uncover long lost government archives detailing what the early US Mint had in mind with these tiny stars. Until then, the subject remains a subject of active investigation. 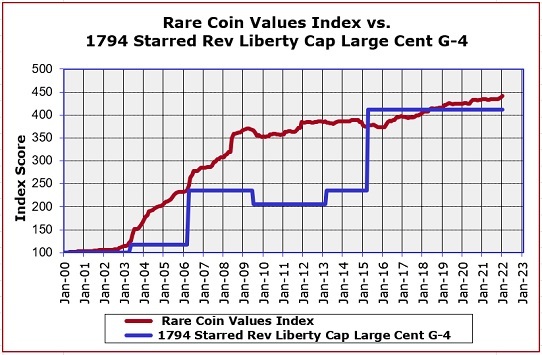 The blue line illustrates the percent change in price of the 1794 Starred Reverse Liberty Cap Large Cent in G-4 condtion, starting in the year 2000, with a baseline index of 100. The red line shows the general direction of the rare US coin market since 2000, as estimated by the Rare Coin Values Index. The 1794 Starred Reverse Liberty Cap Large Cent ranks as an important key date in US numismatics to be sure, though it lags the overall Index considerably. This artifact from the early United States Mint is but one of 87 coins factored in the Index, and is updated monthly.